We’ve got a bit of a hangup with emergency funds on this site – we feel that the advice to immediately save 6 months of living expenses in a low-interest high liquidity savings account isn’t the best course of action for everyone trying to reduce their debt. In fact, the demand is counterproductive, in many cases. Savings accounts pay maybe a percent in interest, but the interest rate on the debt that causes people to hit the search engines looking for sites like this one can be in the double digits – why, again, are we telling people to save for 6 months before paying off their 18% interest rate credit cards? It’s as if someone has fallen out of shape since their glory days in high school, and we insist that they buy $500 of workout clothing before they hop on the bike or start dieting. What… why? Emergency funds are a luxury good – goods that are very useful and, yes, stress-reducing – but at the cost of giving up the investment advantage for some proportion of your funds. For that entire argument, please read Cameron’s three part series arguing the point: one, two, three. The long and the short of it is: emergency funds are an incredibly useful tool that help you sleep easier at night – but are only worth getting once you’re free of your highest interest debt. Why do writers recommend emergency funds? 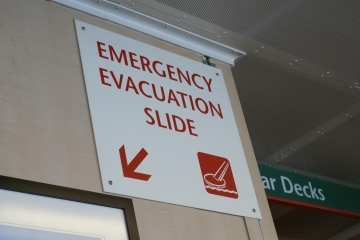 Emergency funds, emergency slides – it’s all good! Well, in case you need to pay for an emergency right? Things certainly happen that can’t be planned for… so aren’t articles like these last two bad advice? Well, let me follow up – why is an emergency fund good to have in an emergency? To avoid putting things on your credit cards. That’s the whole point – emergency funds are usually prescribed to stop people from putting money on their credit cards in emergencies. The greater irony is, of course, that lots of the people who come asking for advice already have too much money on their credit cards. Emergency or not, it happened – and now the real emergency is clearing that debt, not building a six month buffer. I do, yes. I also don’t have any debt with an interest rate more than my mortgage – which is the entire point. I’m giving up a few percent (minus the tax break) on the mortgage for .85% on a savings account. But then again, if I had high interest credit card debt I wouldn’t be trading results for liquidity – I would be hustling to pay down that high rate debt as quickly as I could. And then, yes, after that I would put some money into an emergency fund. So, in essence I’m saying that the order of operations is wrong – recognize that high interest debt is an emergency, and the higher the delta between your savings rate and credit card interest rates, the larger the emergency it is. So, what order would you suggest is the proper order for someone to get out of debt? Should friends who start working out buy workout clothes before starting to diet and exercise? Can you think of a reason why people should go “emergency fund first”? I dislike the term “emergency fund” — hate is too strong. Especially because most things aren’t emergencies. An “emergency fund” is for an income shock, e.g job loss, hours cut, disappearing renter. Not an “unexpected” expense. Car needs tires? Maintenance is an expected cost of owning a vehicle. Water heater went out? Maintenance is an expected cost of owning a home. Someone died? Ok, that’s an emergency. Agree 103.4%. The things we call emergencies and list as things that justify tapping this account are just silly. Recurring payments just don’t cut it – plan for it with your current cashflow, haha. Another “agree 100%”. Clearing out *high* APR CC debt was “Job 1” when we decided to get our finances in order. The other *wrongness* with “immediately save 6 months of living expenses” is that (1) it ignores that most households have two earners, and (2) once you’re out of debt, most of us pack some “fat” into our budgets, which make our lives easier or more enjoyable, but can be eliminated or diminished in case of job loss.